Wishing it was true doesn't make it true--it makes you a chump who fell for the con. Once upon a time in America, no adult could survive without possessing a finely tuned BS detector. Herman Melville masterfully captured America's fascination with cons and con artists in his 1857 classic The Confidence-Man, which I discussed in The Con in Confidence (October 4, 2006). An essential component of the American ethos is: don't be a chump. Don't fall for the con. And if you do, it's your own fault. The Wild West wasn't just thieves shooting people in the back (your classic "gunfight" in the real West)--it was a simmering stew of con artists, flim-flammers and grifters exploiting the naive, the trusting and the credulous. We now inhabit a world where virtually everything is a con. That "organic" produce from some other country--did anyone test the soil the produce grew in? It could be loaded with heavy metals and be certified "organic" because no pesticides were used during production. But what about last year? And the year before? What's in the water used to irrigate the crops? The employment/unemployment statistics are obviously BS. 93 million people aren't even counted any more--they're statistical zombies, no longer among the living workforce. If the unemployment rate were calculated on the number of full-time jobs and the true workforce (everyone ages 18 - 70 that isn't institutionalized or in prison), the unemployment rate would not be the absurdly delusional 5.6% claimed by the bureaucratic con artists. The corrupts-everything-it-touches bribe vacuum known as Hillary Clinton is still disgracing the national stage, 24 years after she first displayed her con-artist colors. Hillary's most enduring accomplishment is the Clinton Foundation--a glorification of bribery, chicanery, flim-flam and cons so outrageously perfected that it serves up examples of every con known to humanity in one form or another. And as she learned from hubby Bill--if the smarmy charm-con fails, quickly revert to veiled threats. "You'll never work in this town again!" Hillary would fit right into Melville's river boat teeming with con-artists. The accent she uses on the marks--oops, I mean audience--changes as readily as the camouflage on a chameleon. Upper Midwest, Noo Yawk, Fake-Southern--what you hear depends on the credulity of her marks. Which brings us to China, one of the greatest credit bubble and financial cons ever. Please examine this chart of the Shanghai Stock Exchange (SSEC). 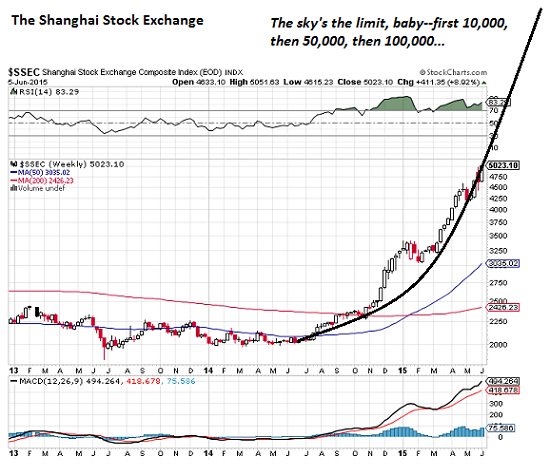 Clearly, there is no upper limit to the Chinese stock market: 5,000 today, 10,000 next week, 50,000 the following month and 100,000 shortly thereafter. The sky's the limit, Baby! That China's credit machine is now dependent on a stock market bubble for its very survival speaks volumes about the true health of China's economy. This dependence was recently explained in Why China Is So Desperate To Blow The Most Epic Stock Bubble. Everybody who thinks China's economy is healthy because its stock market is soaring has been suckered. Every good con-man/ con-woman knows that the con only works if the chump/mark wants to believe the impossible is true--that the snake-oil remedy will actually cure their ailments, that the "hope" candidate will actually change the corrupt system from the inside (ha-ha, they fell for it), and that China's economy is on its way to becoming the world leader in everything. Many people want to believe this fantasy because it suits their agenda: For American pundits, China isn’t a country. It’s a fantasyland. But wishing it was true doesn't make it true--it makes you a chump who fell for the con. We want to believe our political system isn't an unreformable cesspool, that our economy is a vibrant creator of new middle class jobs and that China will manage the greatest credit bubble in history without a hitch. But these are all cons put over to protect the wealth and power of those benefiting from the con. If your BS detector isn't shrieking, it's broken. You've been conned. Wake up.